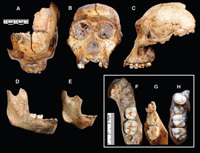 A discovery at a fossil site in South Africa made public yesterday signals a new ancestral addition to the hominid species - one that may prove to be the origin of modern humans from apes. The nearly two-million-year-old fossil, dubbed Australopithecus sediba, is being described as a new species of hominid, which is defined as a primate of a family that includes humans and their fossil ancestors, Montreal Gazette reports. In a report Friday in the journal Science, Berger, 44, and a team of scientists said the fossils from the boy and a woman are a distinctive mixture of primitive and advanced anatomy and thus qualified as a new species of hominid, the ancestors and other close relatives of humans. It was named Australopithecus sediba, meaning "southern ape, wellspring," to indicate its relation to earlier apelike forms and to features found in modern people, Seattle Times informs. It was Berger's son Matthew, then 9 years old, who found the first fossil bone from the new species two years ago. The boy was scouring the hillside for his dog, according to his father, and found a clavicle - a collar bone - sticking out of a rock. Berger said he ran to his son's find and called on his team members to start digging. The issue of ancestry in the fossil record is both clouded and tangled as specialists try to understand the story of human evolution in the thousands of widely varied fossil bones that have been discovered across Africa. And - however important - this newest finding is certain to add still more pieces to the puzzle of human evolution, San Francisco Chronicle says.